iPresas develops software tools for risk calculation and analysis. Our software includes a user-friendly interface which allows the analysis of different loads (hydrologic, seismic, etc. ), the definition of different failure modes (including advanced techniques such as Common Cause Adjustment), the definition of conditional failure probabilities, and the potential consequences in case of failure. Our tools use influence diagrams and event tree modelling for estimating risk for simple to complex systems. Below we include for downloading TWO SIMPLIFIED VERSIONS OF OUR SOFTWARE: iPresas HidSimp and iPresas Flood. 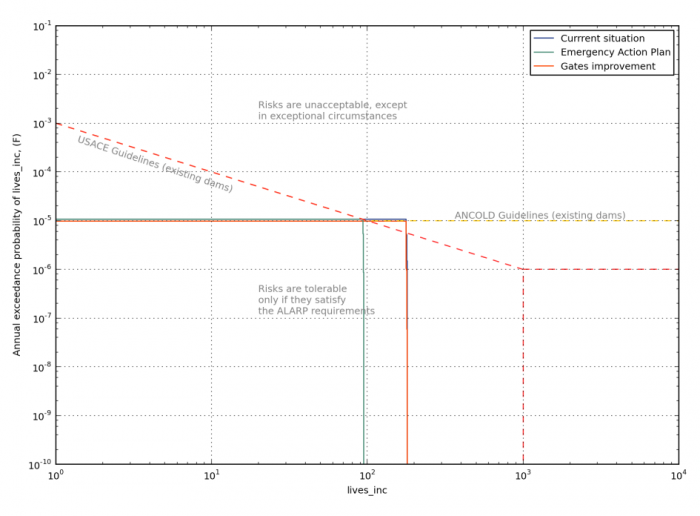 iPresas HidSimp is a simplified version to calculate and analyze hydrologic risk for dams. iPresas HidSimp allows to estimate the dam failure probability due to the overtopping failure mode following a simplified approach. With that purpose, event trees and influence diagrams are used to integrate all information regarding loads, system response and consequences. iPresas HidSimp allows to analyze several scenarios with risk reduction measures, estimate risk indicators for prioritizing actions and evaluate risk by comparing risk with existing international tolerability recommendations, thus supporting decision-making on dam safety management. iPresas Flood is a simplified version to compute flood risk due to river flooding and including Cost-Benefit Analysis of flood defence infrastructures. These quantitative risk results can be used to perform a Cost Benefit Analysis of potential risk reduction investments. This innovative software has a clear and simple graphical interface and it is very useful to quantify the benefits along time of flood risk reduction investments. Benefits can be compared with construction and maintenance costs, justifying the need for investments and promoting a more robust flood risk management. For further information concering our products, please contact us at software@ipresas.com.